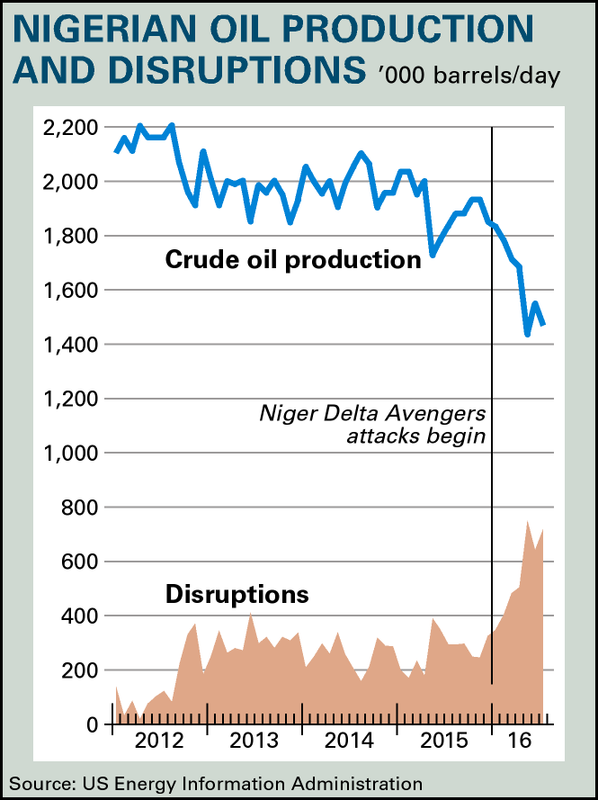 There is an inexorable logic to the tortuous negotiations between the government and the Niger Delta Avengers, the most determined of the militant groups launching attacks in the oil-producing mangrove swamps and creeks. Without oil production, neither side has anything to talk about. That doesn't make the talks inevitable, however. There is a new wave of anger in the Delta, following the death of Chief Thomas Osen Ekpemupolo, the Tunteriwei of Gbaramatu Kingdom and father of the militant leader, High Chief Government Ekpemupolo aka Tompolo. At Chief Thomas's funeral in Warri last week, his family blamed soldiers for his death: the octogenarian Chief had been fleeing an attack on his house when he tripped and fell. Although Tompolo, who is wanted by the government on corruption charges linked to a state security contract, has distanced himself from the Avengers, he has widespread support among the new generation of militant groups. Having fought in the creeks for almost two decades, he enjoys semi-mythical status in the region. As a local security expert pointed out, Tompolo has more combat experience than the average colonel or general in the Nigerian army. That hasn't made negotiations any easier with the military and their proxies. Several senior officers, some close to the Chief of Army Staff, Lieutenant General Tukur Yusuf Buratai, argue that the military can defeat the militants with a smarter strategy. They point to an operation by their Special Forces last month in which five militants were killed and two were arrested. Other officers and civilians are more sceptical. Past experience suggests it would take a long campaign, involving more attacks on local communities and damage to oil installations, to suppress the newer militant groups. More skilled and resilient than their predecessors, they use deep-sea divers to attack far-flung pipelines and geo-positioning technology to escape capture (AC Vol 57 No 16, Juicier carrots, heavier sticks & Vol 57 No 14, Chip off the oil block). With the Islamist insurgency in the north-east and in neighbouring countries far from quelled, it would be a tremendous gamble for Nigeria's military to take on an even more complex and strategically critical conflict in the Delta. Last week, Arjan de Wagt, head of nutrition at the United Nations Children's Fund in Nigeria, warned that as many as 4.5 million people are in need of food aid in Borno State alone. Although the army has chased the Boko Haram militants from the 20 local government areas they controlled a year and a half ago, jihadists are still attacking civilians and spreading fear in communities. In the absence of an effective and disciplined police force in the north-east, the military will have to play a key security role for many months to come. Whatever happens, the military will step up its presence in the Delta but is likely to avoid all-out conflict there. Oil Minister Emmanuel Kachikwu, the National Security Advisor, Babagana Monguno, and State Security Service Director Lawal Musa Daura, head a special team whose task it is to end the crisis. After the government played down the Avengers' attacks on oil installations this year, Vice-President Yemi Osinbajo admitted this month that the country has lost an average of one million barrels of oil a day for the past six months. Combined with the precipitate price fall at the end of last year, that explains much of the financial crisis. It also means that the 2016 budget, premised on an average production of 2.2 million barrels per day (bpd), is not remotely feasible. Even at that level of production, the government would have had to borrow over US$6 billion to finance its bold capital spending programmes. Now it is struggling to pay state salaries. This week, Senate President Abubakar Bukola Saraki called for the government to start selling off its oil industry assets: that would have the twin benefits of reducing the government's liabilities to fund oil production and raising much needed cash immediately, he argued. It's unlikely that President Muhammadu Buhari, a staunch believer in national control of the oil industry, will listen to such advice. Buhari has won some credit in the Delta over the past few months for prolonging the Presidential Amnesty Programme under Paul Boroh, despite both plummeting state revenue due the oil price collapse and mounting evidence of the PAP's central role in corruption under the previous government of Goodluck Jonathan. In coming months, the disgraced Director General of the Nigerian Maritime Administration and Safety Agency, Patrick Akpobolokemi, faces many days in court over the Okerenkoko maritime university affair (AC Vol 57 No 4, The great militant chase). The Economic and Financial Crimes Commission, which brought the prosecution of former Nimasa officials, also has a case against former PAP boss Kingsley Kuku for his alleged looting of PAP funds. Kuku is in the United States, having failed to secure the People's Democratic Party nomination for the Ondo State governorship race in November. As for the maritime university that Nimasa had planned for the Gbaramatu Kingdom, in July former Rivers State Governor and now Transportation Minister Rotimi Amaechi poured cold water on its likely construction. That was widely interpreted as a snub, not only to the Ijaw political elite – Gbaramatu is the spiritual centre of Ijaw nationalism – but specifically to Tompolo, eminent local resident and officially retired militant kingpin. Gbaramatu is Tompolo's base of operations and has been on a high state of alert all year. Alongside Akpobolokemi and others, he is named in the alleged $175 mn. money laundering operation siphoned through Nimasa under President Jonathan's rule. Tompolo refuses to appear in court and army manhunts for him into the interior of Gbaramatu have yielded only local resentment towards the military's heavy-handedness. His whereabouts remain the subject of intense speculation. The Gbaramatu Peninsula neighbours Exxon's oil and gas-gathering facility and export terminal, and is a trunk route for the West African Gas Pipeline, which originates at Escravos and runs, eventually, to Ghana. It's also within striking range of Shell's Forcados export terminal, which the Avengers attacked on 14 February in a spectacular and highly technical operation, bombing its underwater pipeline. It's taken seven months for the pipeline, which normally carries 400,000 bpd to the Forcados Export Terminal, to be operational. According to sources close to Shell and the other operating companies using the pipeline, 250,000-300,000 bpd were lost over seven months, at an average price of $45 per barrel. That's a loss to Shell of $3 bn. Politically both sensitive and combustible, the Gbaramatu area is strewn with weapons and ammunition dumps. Tompolo's supporters have had months to prepare the ground for battle. Defence Minister Mohammed Mansur Dan-Ali presided in mid-September over what was advertised as a 'military drill' of 10,000 soldiers, including Special Forces, around the creeks of Twon-Brass on the Nun River, Bayelsa, a safe distance down the coast from Gbaramatu. It was dubbed 'Operation Crocodile Smile'. 'It's not to harass, intimidate or threaten the community but to protect them from so called miscreants and oil thieves,' Dan-Ali told a closing ceremony of senior officers, in what most in the Ijaw-majority region will interpret as a clear signal that the military men mean business. In August, Bayelsa Governor Henry Seriake Dickson – speaking through his Deputy, Gboribiogha John Jonah – condemned the killing of three soldiers by presumed oil thieves at a notorious trouble spot, Nembe Creek. Jonah was flanked by Rear Admiral Joseph Okojie, who since January has been commander of Operation Delta Safe, which has replaced the Joint Task Force (JTF) and the sprawling Operation Pulo Shield, and now has one unitary headquarters at Igbogene, near Yenagoa, Bayelsa. The tenure of Okojie's predecessor in command, Major Gen. Alani Okunlola, has been severely criticised as a cat's cradle of overlapping operations to secure waterways and catch 'bunkerers', under the cover of which, in many cases, the now-defunct JTF's officers are accused by locals of stealing the oil and gas themselves. Dickson has urged Buhari to continue negotiations with the Avengers. Since the Avengers announced a unilateral ceasefire on 20 August, ostensibly to give negotiations a chance, the government has been quiet about its strategy. The Avengers appointed Edwin Clark, the veteran Ijaw leader and advisor to Jonathan, as leader of their negotiating team. Some in the government may think that with the prospect of production restarting at Forcados and Qua Iboe later this month, there is no desperate hurry to talk to the militants. With the army planning to raise its strength in the region to 10,000 by early next year, security officials may calculate that they will get a better deal if they keep up the military pressure first. Yet regional delegations meeting Oil Minister Kachikwu, who also hails from the Delta, have argued against that view. They warn that other militant groups are proliferating alongside the Avengers and would deepen the crisis if the government didn't act quickly on several regional issues. These include the release of detainees, and the return of three speed boats and the 'Golden Sword' of the Gbaramatu Kingdom, which were seized by Nigerian soldiers. Prepared for Free Article on 25/04/2019 at 02:50. Authorized users may download, save, and print articles for their own use, but may not further disseminate these articles in their electronic form without express written permission from Africa Confidential / Asempa Limited. Contact subscriptions@africa-confidential.com.